Just add to any water bottle, and POWER UP your water! Want great-tasting, chlorine-reduced, alkaline water wherever you go? Now you can! 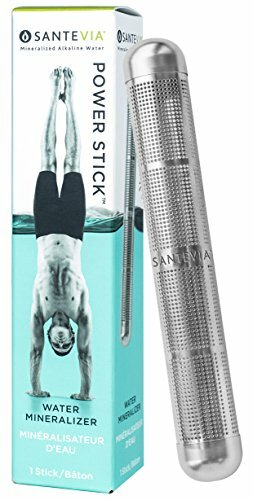 With the Santeria POWER Water Stick, get clean, mineralized, alkaline water from your tap at home, office, yoga studio, gym, and outdoor water fountains. Simple & Easy to Use Activate the Santeria POWER Water Stick by submerging it into bottle or glass. Shake or stir for 30 seconds. Water will reach optimal pH and chlorine reduction within 3-5 minutes. Shake out chlorine. Shake in minerals. No sucking through a filter or squeezing the bottle necessary. What a relief! Eco-Friendly Each Santeria POWER Water Stick lasts 3 months or 180L / 48gal. You can eliminate 300 single-use plastic water bottles from entering the landfill with each Santeria POWER Water Stick. Lab Tested Test results meet or exceed NSF/ANSI Standard 42 for chlorine reduction, taste and odor. Intended for use with microbiologically safe water only. Keep Healthy, Alkaline, Mineralized 75% of North Americans are chronically dehydrated, while 90% are chronically de-mineralized. The Standard American Diet is acidic and leads to health problems. Combine a nutritious diet, exercise, and lots of Santeria Mineralized Alkaline water to keep your body strong and healthy!. If you have any questions about this product by Santevia, contact us by completing and submitting the form below. If you are looking for a specif part number, please include it with your message.